Savta Simcha and the Incredible Shabbes Bag The Jewish "Mary Poppins"
When an unusual old lady from Jerusalem turns up in Wintergreen City, U.S.A., carrying a large, black, lumpy bag, strange things begin to happen! Dovid Comes Home A young boy goes to help his mother shop for Shabbos and meets interesting people who help him find his way back home. Shabbat Soft-toned watercolors show a happy traditional family observing Shabbat, the Jewish Sabbath. They prepare for the special Friday night meal, welcome grandparents, light the candles, say the prayers, and enjoy the traditional meal; they attend synagogue on Saturday and mark the Sabbath's end at night with a blessing for the coming week. In a simple rhyming text, one of the children describes the traditions, and she quotes and explains some of the blessings ("Hamotzi is the prayer we say before we eat the bread"). She enjoys the synagogue service ("I know a lot of prayers by heart because we come each week") as much as the observance at home. A long, useful note at the back fills in the details for adults and will be helpful in discussing the meaning of each part of the observance. A fine first book for family sharing. The Shabbos Queen and Other Stories The Children's Learning Series is designed to encourage young readers. Packed with amusing, educational stories and written in clear and concise language, these books teach children to enjoy reading while showing them the beauty of performing mitzvos and helping family, friends and neighbors. Reprint Available Soon Malkie just can't wait for Shabbos. But there is so much to be done! 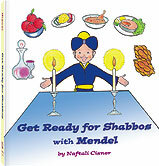 This beautifully illustrated, full-color book helps children relate to Shabbos preparations with simple descriptions of all the household takes that enliven the end of the week. The Bird of Paradise and Other Sabbath Stories A collection of Jewish stories, including original tales and adaptations from the Midrash, the Talmud, and the Chasidic masters, based on the weekly portions from the Torah. Come, Let Us Welcome Shabbat A family guide to the Friday night home observance. Blessings for candles, wine, and challah, thoughts about the meaning of Shabbat, words and music to blessings and songs. Now includes blessings for Havdalah. With soft watercolor illustrations. By Michoel Muchnik Cheered by the warmth and joy of the Sabbath in Kalman the Clockmaker's home, a little wooden cuckoo comes alive and starts an interesting chain of events. In this charming book, the author tells of a wondrous event which comes to pass in Shir, a town that is blessed with love and peace. Can a wooden cuckoo bird fly? Can a wooden cuckoo bird get married and have children? All this is possible if you read this book. Shabbos (Vol 2) Stories from the Talmud, dramatized for children. By Diana Lederman A game, reading book and learning tool all in one! Kids learn Jewish tradition through full color pictures and words. Available in 6 titles: High Holidays * Shabbat * Pesach * Israel * Purim * Chanukah. The Dink That Stopped the Clock An adventure in the land of Miroop. Queen Ootz-Rootz is in a hurry to prepare for Shabbos! Shabbos Is Coming Follows one Jewish family through the week as each individual member prepares for the approaching Shabbos, the seventh day of the week. By Marcia Bitman A sensitive story of two young friends who discover something new about the Sabbath. Shimon discovers a cure for the Shabbos Blues. Scott discovers the Sabbath Queen. One Boy's Pesach Preparations in Jerusalem's Old City Follow Raffi, a lively five-year-old who lives in the Old City of Jerusalem, and watch him get ready for Shabbat and Pesach. Great full-color pictures of the Old City. By Naftali Cisner Preparing for Shabbos can be exciting! Inspire a child with the magic of Shabbos. Join Mendel as he prepares for this weekly treat, in a fun and adventurous way. For babies to preschoolers. My Jewish Days of the Week By Dvora Waysman The days of the week are filled with school, chores and fun ... but the characters in this book know exactly which day they love the most. Exciting illustrations and clever rhymes help teach preschoolers the days of the week and the joy of Shabbos. My Jewish Days Of The Week is a fun-filled, day-by-day journey through the week. Beginning with a family Sunday spent in the garden, a busy Monday spent at school, and ending with Thursday grocery shopping and Friday cooking and cleaning -- all in preparation for ushering in and observing Shabbos. Catchy rhymes and old-world illustrations portray everyday life as a joyous adventure for young children. Melanie Schmidt's illustrations wonderful showcase Dvora Waysman entertaining text which is enhanced with a glossary explaining words that may be unfamiliar to a young reader, and a beautiful chart at the end of the book reviewing all the days of the week in both English and Hebrew. Highly recommended! By Michelle Gabriel Watching Bubee make challah every week is only part of learning how to prepare the Shabbes bread. It's not until Rucheleh takes matters into her own hands that she finally discovers what she needs to bake her very own Rucheleh's challah.